What store did you purchase this in? I got it at a Services area near London. I originally put the picture up, and I purchased mine from Ellesmere Port. They had 4 in on Monday and it was limited to 1 per person. 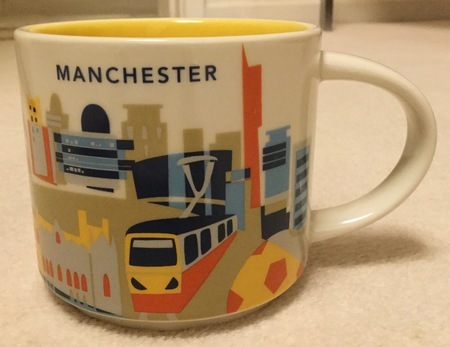 I have been in Manchester today (Saturday 8 April) and none of the stores in Manchester City Centre have this mug in. I did speak to a District Manager, and was told "Starbucks like to put these mugs in tourist destinations not necessarily in their own City". I would suggest probably it could be in Terminal 1 of Manchester Airport Starbucks. i found mine at Sheraton Skyline Hotel near London Heathrow Airport!